We are always learning about the great work our users do. One of the most exciting parts is seeing how apps made with AppSheet are helping improve and grow our communities. 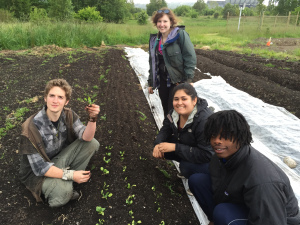 Seattle Youth Garden Works-- a program of Seattle Tilth –empowers homeless and underserved youth through urban farm-based education, job skills training and employment. The program, which runs a small urban farm in the University District and also farms at the Rainier Beach Urban Farm and Wetlands, has youth ages 16-25 coming together to grow food to sell at local farmers markets; developing leadership skills and personal connections to the food system. Seattle Youth Garden Works is using their apps to simplify their program and improve the services they offer to Seattle’s youth. Each spring, Seattle Youth Garden Works holds an eight-week working interview for youth who are experiencing barriers to conventional employment. During this trial period youth gain a lot of valuable knowledge and experience around organic agriculture, teamwork, and the basics of having a job. It’s a time for them to discover and cultivate new skills and to challenge themselves in new ways. Successful completion of the program leads to a job offer to participate in the year-round program, which includes field trips, classroom discussions, and cooking and nutrition education. At the beginning and end of the program crew members are asked to fill out a survey that asks questions about their current circumstances: whether they’re in school, employed, their housing situation, and nutrition practices. Christian Cain is a Seattle Tilth Program Specialist working with Seattle Youth Garden Works who was tasked with updating the program’s evaluation system. Seattle Tilth wants to know what the youth are getting out of the program and track how they progress with greater life goals. Christian was looking for a way to automate the survey process when he found AppSheet in Google’s add-on store. He used AppSheet’s Google Forms add-on to turn Seattle Youth Garden Works’ intake survey into a mobile app. 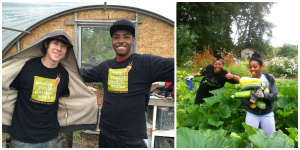 In the past, the Seattle Youth Garden Works team used paper surveys to measure program goals. Christian and his colleagues had to keep track of the papers while on site, then manually transcribe the hand-written information onto the computer at a later time. Seattle Youth Garden Work’s new mobile app is already helping the organization cut down on lost time, resources, and effort. For one, having the ability to type information into a device eliminates the need for lugging papers and materials to and from the farm. And being able to work offline ensures data won’t be lost when it’s entered at the farm where service isn’t available. Once he’s back online, Christian just hits “Sync” and all student information is then sent back to the master spreadsheet. For Seattle Youth Garden Works, manual data entry is a thing of the past. In addition to streamlining on site activities, the app also carries compelling implications for the future of the Seattle Youth Garden Works program. Using data summaries, Christian and his colleagues are able to glean invaluable information about the program’s efficacy and a bird’s-eye view of what’s working or what may be lacking. The information Christian is able to get from the apps will be incomparable when it comes time for fundraising and grant writing. He may now provide potential contributors with detailed program efficacy information, which will demonstrate its success and garner even more financial support. **If you work for an education or non-profit organization, learn how you can create your own mobile apps at a 50% discount.